A Compost Tea Recipe that addresses a number of special garden needs. The reason compost tea is so valuable is that it helps us to grow nutritious vegetables and fruit that are full of wonderful trace minerals! From the choices below, you can choose the compost tea recipe that is right for you. For the first two recipes, use a compost tea brewer, one that continually pumps air through the water while making tea. We want the aerobic bacteria that need oxygen to multiply, not the anaerobic bacteria. 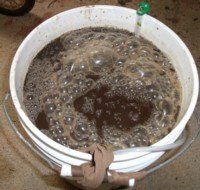 Click here for instructions on how to brew compost tea. Earthworms are God’s gift to gardeners. Earthworms ingest earth, digest it, then excrete it. The excrement, called vermicast, leaves the worm seven times richer! 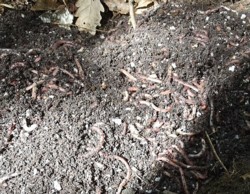 Earthworm castings contain plant nutrients, growth enhancing compounds, and beneficial microbes. Gardeners have actually seen a 170% increase in plant growth from using vermicast tea, compared to plots grown without vermicast tea. My compost tea recipe for making tea from worm castings uses a 5 gallon bucket, four gallons of water and 1/2 pound of vermicast. Add in 4 tablespoons of unsulfured molasses, and two ounces of concentrated sea minerals, which are an excellent source of trace minerals, plus a food source for the bacteria. You can get all the benefits of vermicast tea and more by simply using a high quality soil conditioner to greatly increase the number of earthworms in the soil. Such a soil conditioner inoculates the soil with even more beneficial bacteria than vermicast tea. It also highly structures the soil. A third benefit to this soil conditioner is that it causes the plant to sequester a great amount of sugars (carbon) into the soil. This is the fastest way to build high quality top soil. Mushroom compost is the growing medium used to grow mushrooms. After the mushrooms are harvested, the left over soil residue is gathered and sold a fertilizer. This is one of the valuable soil amendments. 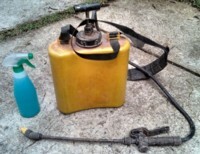 I use in my garden, and may be used alone or with other compost to make compost tea. It may be purchased at local nurseries or garden supply stores. Add 1/2 gallon of mushroom compost to four gallons of water, add 4 tablespoons unsulfured molasses, and 2 ounces of concentrated sea minerals. As with other compost teas, it will be ready for use in 2 or 3 days. Is your soil pH over 7.5? That’s too high for most plants to thrive. Anaerobic tea is brewed, not for it’s beneficial bacteria, but for its ability to lower the pH of high pH soils. Some bacteria need air to multiply, others work in the absence of air. Take away the oxygen and anaerobic bacterial will take over the work of breaking down organic matter and releasing nutrients. Anaerobic bacteria cause organic matter to rot, giving it a terrible stench. However, if your soil pH is over 7.5, this tea may help to quickly lower the pH of your soil, while feeding your garden. For the compost tea recipe for anaerobic tea, take fresh green grass clippings and put them in a sealed container like a garbage can, and put it out in the sun for a couple of weeks. The anaerobic bacteria will do their work. Drain off the juice, dilute it, and spray it on the soil. Once applied, make sure and wash the tea off of your plants. You can then scatter the left over residue on your garden, and water it in. This is a natural and cheap method to reduce soil pH. The odor will dissipate in a few hours. For more information on growing a healthy vegetable garden, click here.